.25 ACP breech plug. A win-win. Cleaner; more accurate. 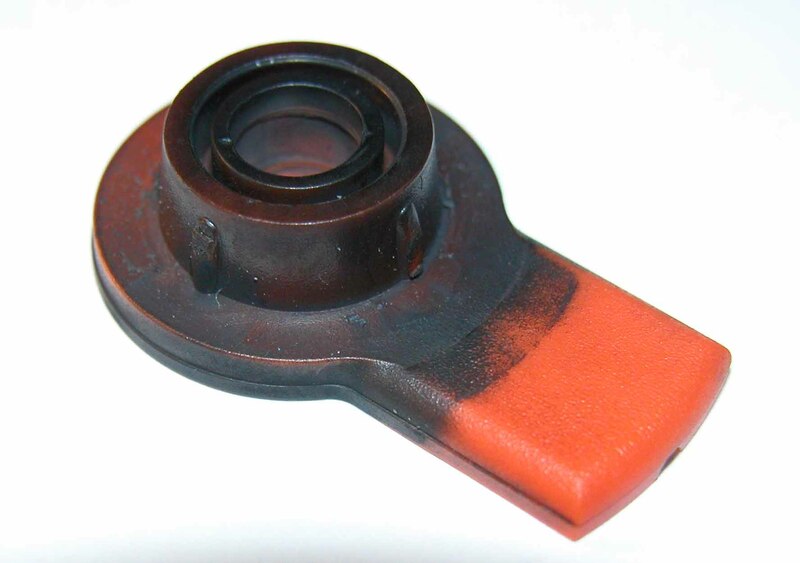 See all NEF breech plug options listed at end of article. NEF primer carrier after two shots. 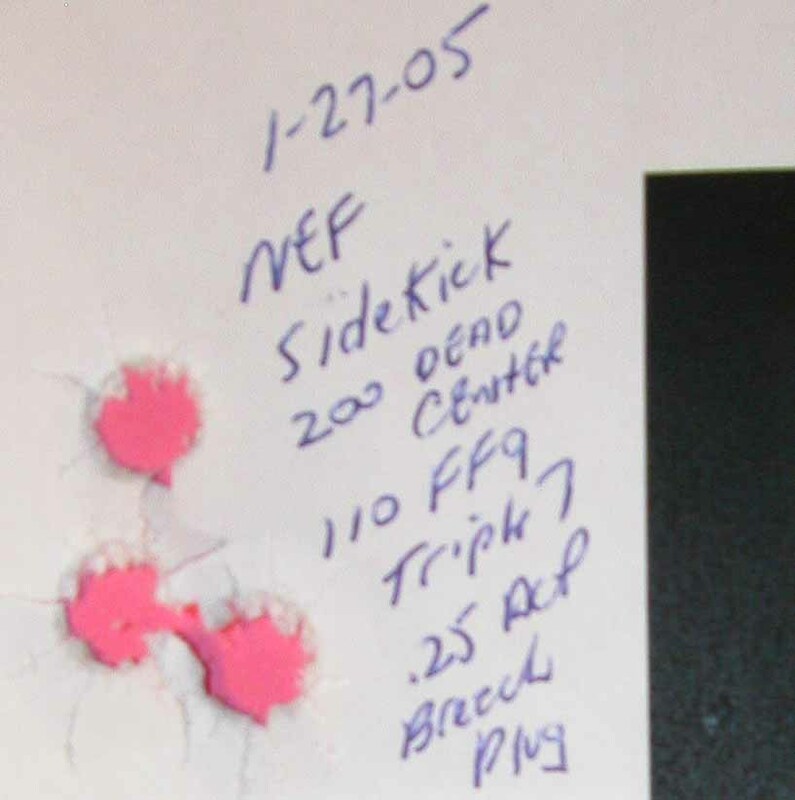 Above: Targets shot with the NEF Sidekick with the .25 ACP breech plug. Cleaner and more accurate. Both groups measure around .6 "
We only shot a couple of three shot groups with the Sidekick the way it came to us. As you can see by the photo of the primer carrier above, it was quite filthy. Out of the box accuracy with the factory breech plug was about 3.5". We did nothing to this gun except replace the breech plug with our .25 ACP conversion. I believe the above targets speak for themselves. We found the Sidekick quite pleasant to shoot. It handled recoil well until we tried the 350 gr bullets when it became obnoxious. The 200, 220 and 240 .40 caliber Dead Center bullets all shot well but our gun definitely shot the very best with the 200s. 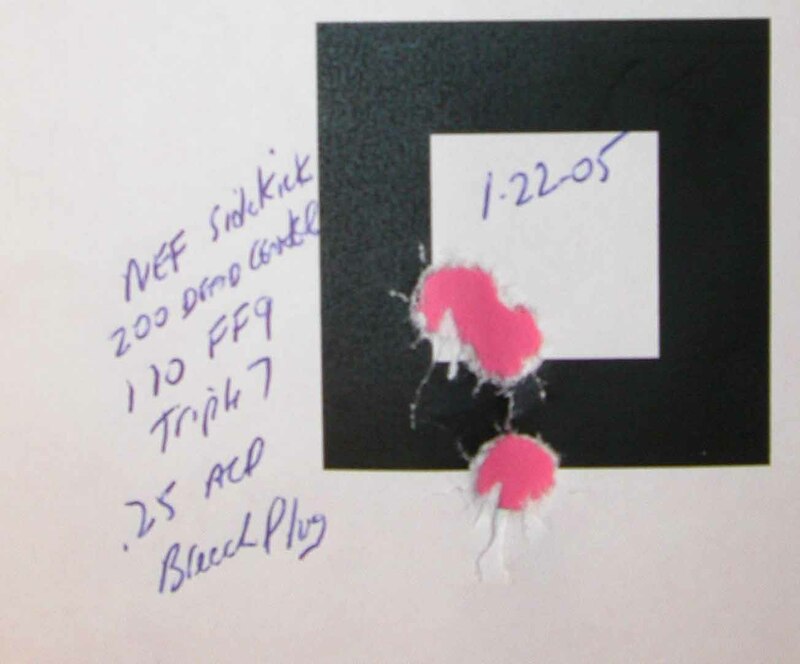 Once we found the sweet spot of 110 gr of Triple 7 ffg powder, our .25 ACP equipped Sidekick did not shoot a single group over 1.5" in the three days of shooting that we put it through. No more plastic to buy. Prime and reprime the ACP brass as many times as you wish. Great value and performance for the price. I would recommend the .25 ACP equipped Sidekick to anyone. .25 ACP breech plug for $69.95. The kit includes 10 - .25 ACP unprimed cases.